As with most of my reviews, I wrote a first, introductory post on P Johnson last year, after they opened in London. My apologies that the full review, here, has taken so long. In that time John, James and the others have moved from the pop-up in Soho to a permanent location just north of Tottenham Court Road. They have also rebranded - dropping the word 'tailors' from their name, among other things, which I heartily welcome. P Johnson are not tailors, although some like James Johnson have had training at Andrew Ramroop's Savile Row Academy. They are, rather, an interesting and potentially good-value option for made-to-measure. Patrick offered to make me a jacket and trousers (for free - not the norm, but it does happen) in order to review. I opted for a linen jacket in denim-like blue from Solbiati (S01049) and a pair of white cotton trousers in a denim-like weave from Loro Piana (LP641006). The jacket had the middle of P Johnson's three structuring options. You can see the three pictured on my original post: essentially a slim shoulder pad and two layers of canvas, a very thin pad and single layer of canvas, and no pad just a touch of canvas in the shoulder. I'd recommend either of the first two, but the latter only in a shirt jacket or similar. The jacket was strong in the fit, but less so in the style. James took the original measurements and then conducted the fitting, and the result was good for made-to-measure. The shoulder line and chest were clean, as was the fit through the waist and hips. The pitch of the sleeve was also good, as was the length. The back is pretty clean (bear in mind this is linen). The only small issue was with the vents kicking out a little over my seat - always a difficult point for made-to-measure tailoring, and something we did try to address at the fitting. The bigger issue was style. As you can see, the jacket is a little shorter than I would normally wear - perhaps 2cm. And we already lengthened the standard jacket by 1.5cm to get to this point. The buttoning point was also lowered by 2cm - so proportionately, lowering it a little compared to the length - but it still feels a tad high. I'm also not a big fan of the lapel line, which is a little narrow and has perhaps too much belly on it, curving up towards its tip. Of course, this is the lapel I chose, but with made to measure there aren't infinite varieties of style. P Johnson offer two standard lapel widths, of which this is a slightly widened version of the narrow one. And with MTM you can't start re-drawing the lapel line - the changes have to be regulated enough to be fed through a system back to the factory. It's for this reason that I focus on the style of the jacket here, and consider it important. I'd also say, on balance, that the P Johnson style is more suited to younger guys that want a shorter, more contemporary cut. The trousers, on the other hand, were great. The waist needed to be taken in a little at the fitting and the thigh narrowing, but that was about it. Nice fit through the seat, clean line down to the shoe, and perfect length. Style is of course less of a factor with trousers, but there was no hint of making these too tight or too short. I try hard also not to be influenced by choice of material, but the Loro Piana cotton is beautiful (soft and comfortable, but with a touch of the hardiness of denim) whereas the Solbiati linen is a bit too saturated for me, and lacking depth in the texture. Neither jacket nor trousers are made to the highest quality level, but that is reflected in the price to a certain extent. But the collar is also not attached to the jacket by hand. The top stitching is by hand, which is nice, and from what I've seen it is all cut by hand, but overall there are higher levels of make in MTM. That goes for the trousers too, which are fine but don't have the hand-tacking or other sartorial details of some MTM. As I said, this is reflected in the price. The starting price for a P Johnson jacket is £960, which is pretty good. And trousers on their own start at £265 - which is what most top-end ready-to-wear trousers cost in London. For anyone looking for that perfect pair of flannels for winter - and with a big range of cloth to choose from - P Johnson could be a good option. These are definitely starting prices, however. My Loro Piana ones would have cost £450, and the jacket £1100. Worth clarifying the range of pricing before going through all the bunches. On the subject of quality, it's also worth saying that P Johnson are moving all their tailoring production to the factory in Carrara, Italy, but historically pieces have been made elsewhere, including China. There is also potential confusion with the fact that their cheaper line in Australia - Suit Shop - is made in China, as is some of the new ready-to-wear clothing (such as linen shirt-jackets and trousers). Now I have heard P Johnson salesmen being a little misleading about manufacturing - suggesting that pieces are cut on site, or that chests and hand-padded, for example. But I know this is not the aim of Patrick, John (Glass, pictured above) or anyone else. They want clarity and consistency across the team, and across the stores. I also think we should be a little tolerant of how brands grow and develop. It is natural to think that brands are born fully formed, with a clear mission and a consistent product. But that rarely happens. Most take a few years to find their feet, be 100% confident in the style and make of their product, and their communications. One of the things I found most interesting about having MTM at P Johnson was the way it made me appreciate bespoke - particularly that lovely hand-rolled lapel line. But this is not bespoke and should not be compared to it. Rather, it is well executed MTM with a strong, contemporary style. 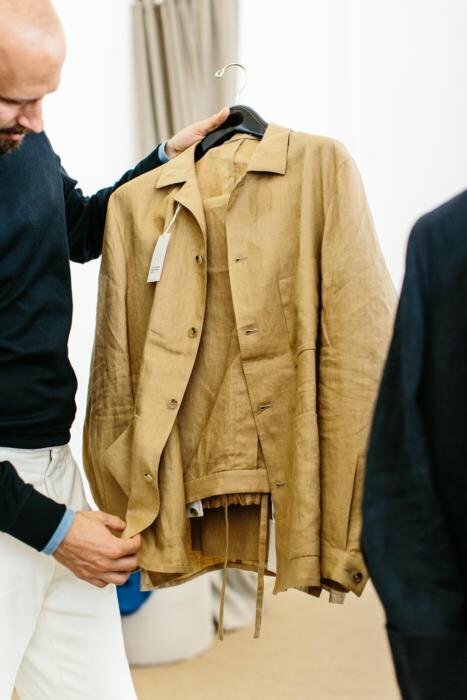 I'd certainly recommend exploring the trouser option, and the more casual pieces such as the shirt-jackets, in linen for summer (below) or wool/cashmere for winter. You can follow the discussion on P Johnson tailoring – Review by entering your email address in the box below. You will then receive an email every time a new comment is added. These will also contain a link to a page where you can stop the alerts, and remove all of your related data from the site. Hi Simon, I’ve had three suit from P Johnson over the last two years, and I think that for someone like me (mid-20s, wear a suit everyday, fairly slim) they are a really good option for everyday wear. The fit had improved each time, to the point where I would now be comfortable ordering from a swatch book remotely. One thing I have found is that they are not the best at responding when you have quality control problems, and their alterations set up can be difficult to deal with remotely. A friend of mine had real problems when his trousers just did not fit, such that he ultimately gave up trying to get them sorted. If you are very clear I eat the impression they will do a remake, but really push you towards alterations first, which does not necessarily lead to satisfactory results. Thanks Ben, that’s interesting. Where are you located, if I may ask? Hi Simon, I’m in Australia. That might be another point – the suits do work well for warm weather as they tend to be a bit lighter. I don’t mean to be overly critical about QC, but I think that it might be a consequence of having salespeople (who don’t have skin in the quality game so to speak) v craftspeople (who do) being the people you deal with when there are issues. I think it’s great to be reviewing some of these MTM makers – I have an interest in what I wear, but a reasonably limited budget so I find at this stage in my life MTM is the way to go. Thanks for the thoughtful comments. I think your comments are probably truer . This is a ‘youngish’ tailor designing a style for thin 20/30 somethings. Your points regarding service are interesting. How many times are we asked by tailors “so how does that feel/ look?” in a manner which really means “please don’t be awkward just accept what you got”. Something that probably stems more from salesmen needing to maximise profit and with no interest in the craft . Good point, although I’d say it stems more from the fact that tailors are not designers – have no training to be so, little exposure to it, and usually no real desire to be one. If you want his cut, which is normally for a pretty standard business suit, go for it. On that note it can be geninuely a bit like dealing with architects and builders …. both tryin to give you what they want and not what you want. And when you argue this they (tailors) dismiss your suggestion as ignorance . I wonder how many commissions are lost through this attitude . We really need to get tailors to u derstand how much we appreciate their craft and skill even if st times we don’t appreciate their suggestions . If I remember right in an older comment you mentioned you prefer a tailor altered high quality RTW over a MTM. Is that so considering your experience with P Johnson? It’s the case with most MTM, yes. But the essential problem with MT is that the quality varies enormously, more than any other category. At one end you have an inexperienced salesman taking in the waist and shortening the sleeves on a RTW piece. At the other, you have Edward Sexton, master that he is, cutting you a pattern and then having it assembled offshore. In general, I think it’s worth avoiding broad statements about MTM. I shall try to do so as well. Do you have any interest in covering Steed tailors, or is their house style too close to A&S to be of interest for you? Their MTM seems fantastic value at £750 for a jacket. I’d certainly like to at some point James, yes. On the point of Steed, what is the difference between them and English Cut? They seem to share the same premises (or address at least), and from what I understand Edwin has been running things at English Cut since Thomas’ departure. Given the gradual fetishism of bespoke, this looks like an excellent proposition. The prevalence of bespoke, rather worryingly, has become associated with part-payment for exposure on a dandy’s instagram account. I note that you are now clarifying (in your posts) whether you pay for your commissions in full or receive discounts. Such disclosure, now and in the future, is most welcome. Thanks Gus. I usually do when it is free, but that doesn’t happen often. Why do you bother with such poor quality? If that is where you ended up with the coat after making amendments to it, I would have asked for a refund and left the building. For the same money you could, for example, go to Edwin at Steed and get MTM you would be happy to wear. Several misleading things there. One, I didn’t pay for it. Two, readers have long said that they find reviews like this extremely valuable as they consider buying them themselves. And three, from what I’ve seen you would not get the same style at Steed. But you would get something that fits you,properly from Steed……. 100% with you on this one Simon; please don’t be put off by the negative comment! I believe I speak for many readers when I say that, while it’s wonderful to read about your commissions at the very top-end of bespoke, there’s also a real benefit to hearing your experiences with more affordable options. Nobody should expect the level of quality to match that of bespoke, but it’s extremely helpful to get your perspective on how the price/quality trade-off plays out. This is especially important as mid-range brands seem to suffer more from biased reviews in exchange for freebies (it’s hard to imagine C&M or Cifonelli ever doing this) so the impartial perspective of PS is much appreciated! I’ve had MTM done by Steed and this actually looks better than what they made for me even after I sent it back for an alteration. The styling is not necessarily to my liking, but the fit is definitely better than what I’ve experienced with other MTM operations including the internet darling Steed. Interesting review. I’m afraid the blue jacket, at least to my mind, is one of the least flattering things you have had made. It is indeed too short and the buttoning point does not work with those open quarters. It may just be the photo, but the back seam looks off-centre. I also don’t think the price is justified. At that level, you can still get something fully bespoke made if you are are prepared to venture beyond a W1 postcode. The trousers look better. Thanks. I don’t think the back seam can really be judged in photography like this, particularly in a lightweight linen. True with a little research and luck there are great tailors beyond Savile Row. I used to use a tailor near Tunbridge Wells, in Kent, sadly for me he is now retired. He worked for 30 years in Huntsman before setting up his own place. Since he didn’t have the overheads of savile row he was able to offer the same quality at a much better price. Richard Anderson outsourced work to him when he too set up on his own. I believe his son and former trainee are now both at Dege & Skinner. 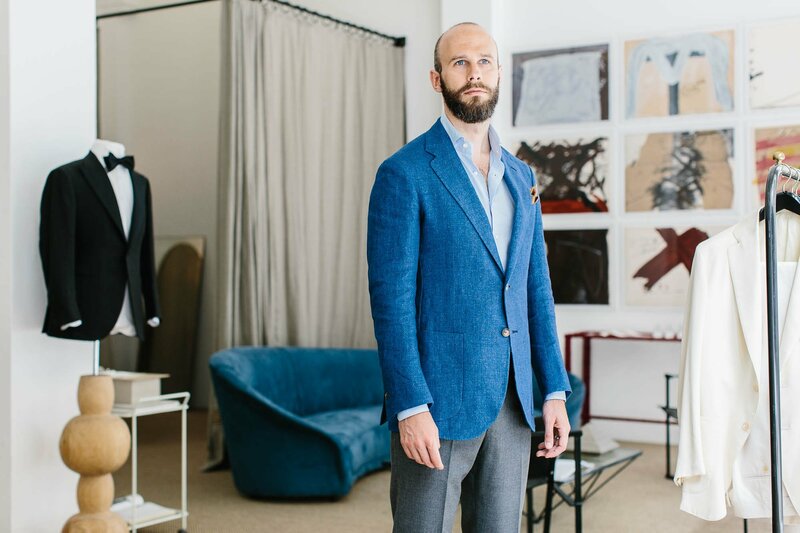 How would you compare the jacket, value-wise, with low-end bespoke like Graeme Browne? Just in terms of value, Graham Browne remains pretty much the best value anywhere – Whitcomb & Shaftesbury being the main contender. But of course the styles are very different. In terms of styles, how would you describe Graham Browne vs Whitcomb & Shaftesbury? How did you feel the armscye Simon? Looks a bit bulky on the right side of your chest. I always find that MTM never gets the proper fit on the armscye. I actually kindda like the belly from this lapel. Thanks Simon, this is informative and helpful indeed. How do you compare P. Johnson to Anglo Italian, who also offer a MTM suiting for a very similar price point? Thanks! Interesting article which as well as reviewing the suit inadvertently gives a better understanding of the MTM v Bespoke aspect. Taking what you’ve said and given the price points I’m sure I’m not the only reader who then starts the comparison discussion in my head. P Johnson MTM or say A bespoke from Grahame Browne / Choppin or others ? Beyond the differences in style, how does this compare, in terms of value, with bespoke tailors like Graham Browne or Choppin & Lodge? Given the similar prices, wouldn’t it be preferable to go for bespoke? Of course, with the caveat that one is not particularly focused on PJ Johnson’s design. Firstly congrats to P Johnson . it is a much needed addition to the world of tailoring / MTM. Having checked him out on YouTube I like his attitude and do think he is bringing something new. However given that there is so much MTM being touted let’s for a moment try to understand this better. But most MTM, not just P Johnson, don’t seem to state what their ‘block’ is . Is it a narrow lapel, a higher notch lapel, a higher armhole , a narrow waist or a particular rise on the trouser ? They never mention this ! In P Johnson’s case it emphasis’s the lightness of the suits . But surely the ‘block’ of the MTM is not so relevant for this as this is more to do with canvassing (or lack of). P.S. Simon , a reutterance of what you can and can’t get with MTM would be useful for a future article . lots of photos of what MTM fixes and doesn’t. MTM is huge at the moment on and offline. Don’t underestimate how much your professional input is needed in this area. How does the length of the ‘house block’ at Anglo-Italian compare to the tweaks made to the length here. Difficult to say perhaps but from first view would you foresee adding some length to Anglo-Italian jackets too? That was a well written and balanced review. 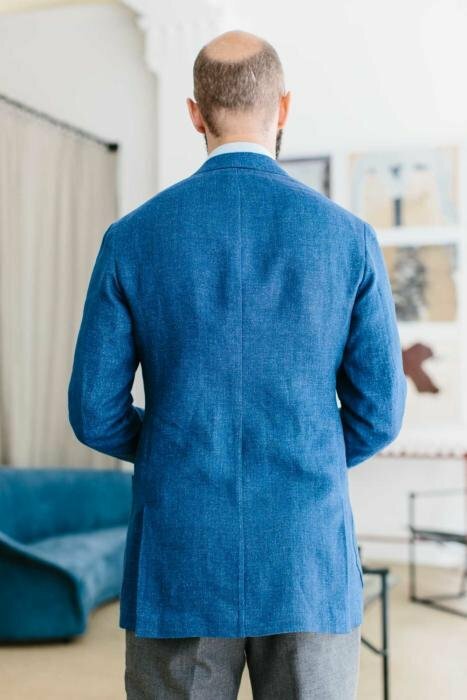 Are there any other MTM tailors in London that offer a similar soft style of tailoring that you would say is higher quality? I know someone raised Anglo Italian – any others that you’re aware of? There aren’t many. London has been rather behind on soft tailoring, tied a little to its traditional structure. Why ‘behind’? Do you consider soft tailoring to be superior to structured tailoring, like some kind of evolution of tailoring towards higher forms? I think it’s a very dangerous notion. If Savile Row were to copy Naples, what’s the point of Savile Row? Horses for courses, I say. Let us have choice. No, I do not consider it to be an evolution behind structured tailoring. I said London has been behind on soft tailoring, as in behind other cities in adding it to its mix. Thanks for the additional recommendations, Simon. Given the weight of amount of negative comments, I feel as a someone who has tried a variety of tailors – including PJohnson for many years – I need to add my voice and bring some balance to the debate. First I’m a long term client. When I got my first PJ suit, I was measured by Patrick himself. When I moved to London two years ago, for my next suit I was measured by the other partner, Tom (they didn’t have an London store then and Tom and James travelled out). All of the suits made to those measurements fit perfectly. My first Sartorial Carrara suit had a fit issue in the trousers, which couldn’t be fixed completely so they offered me a discount. My second was good. PJohnson suits, above all else, are good quality. My oldest suits I still wear today (they’re over 5 years old now) and I’ve never had a tear and they still fit as well as they did on day one. Do they stand up to bespoke? No. My solito suit fits beautifully, has a wonderful roll in the lapel and has amazingly high armholes that make it extra comfy. It also cost double. There’s also some wear and tear after a year which I will catch up with Luigi about. 1. Not like the style – good on ya; stick to your own English cut then. 2. Questioning the quality without trying it – it stands the test of time. 3. Questioning the fit without trying it – it fits great considering it he price. 4. Getting mad that they weren’t up front about using Chinese factories. Honestly, I was told the same thing back in the day – that PJ Roma was made in a workshop just outside Rome. If that was a lie then it breaks some trust and I am a disappointed. It doesn’t, however, change the fact that I’ve had a nice suit that fits me well for the past 5 years at the price I would have paid for branded RTW. That’s the bottom line for anyone looking to try the product. Honestly in hindsight it doesn’t matter one bit whether the suit wasn’t made in Italy or China – the country is simply a proxy for quality and it met my expectations considering the price. I bought 3 or 4 suits from P Johnson and am very disappointed they lied about being made in Italy vs. China. Yes the quality is good for MTM but also they charged a premium for what was supposed to be made in Italy. I know for a fact they actually almost got in trouble with the government for changing Made In labels as things were being imported or totally removing Made in China labels. I am not fond of short jackets, but this one does at least fully cover the seat. The overall fit is not bad, however. The trousers, on the other hand, do look a little short. Thanks. I think the image from the back is a little distortionary. I wouldn’t say it completely covers the seat. The first is possible and widely available. You get it on most top-end RTW as well. The second two are possible, but available on very little MTM. Formosa, as an example has it, but they are a tiny exception. What is a hand rolled lapel? I can’t recommend anyone similar in Paris I’m afraid. On the person, it’s very hard… Ideally it would be someone trained in tailoring taking the measures though, or at least with experience. Not a new sales clerk. You really are talking tosh when it comes to it. Your jacket simply does t fit, and cost £1100. You should be telling your readers, most of whom seem th have no clue, to avoid. This company. Can you please expand when you say that the jacket ‘doesn’t fit’? I understand that some matters are points of style (jacket length etc) but a proper explanation would be useful to the other laypeople here. I assume from your comment that you have more of a ‘clue’ than me! sleeves too short, coat too short, button stance wrong, crack in lapel, vents badly formed…………..isn’t that enough? A Eurostar ticket plus the price of a Graham Brown suit comes out cheaper than the cheapest Paris tailor. I’m not being facetious. Ditto for bespoke. I made a comment to this effect when Mr Crompton reviewed Cifonelli. I happen to think that Paris prices are inflated, and it’s not all down to quality. Some of it is due to the minuscule size of the market, and the unassailable French belief that money = quality. That being said, you can try Aspen Retouches (8, rue Jean de La Fontaine -Paris 75016). They mostly do ‘retouches’, as the name shows. But the tailor who runs the shop is an old hand who used to work for Cifonelli, among others. He knows his trade. Yes, Cifonelli are more expensive. Prices start at 5000 or 6000 euros. That’s above the starting price for many excellent Savile Row tailors. Also, is it important who actually cuts your suit as long as the quality is up to the standards of the house? Besides, how would you know anyway? Do they not outsource to third party tailors sometimes? All tailors are theoretically freelance, they all work for everyone. So it’s never clear cut. Cutters are in-house however. I agree about the lapels and button stance. Not flattering at all. Thanks for the honest and unbiased review Simon. I have purchased from P Johnson in the past , prior to them producing in Italy. At this time they were very clear about they products being manufactured in Europe. I was told this in person and it was advertised on the website. This wasn’t a teething problem of a new business. This seems to have been deliberate obscurantism to make sales and increase the perceived value of their product. While it doesn’t change quality of the samples I saw prior to buying or the product I received, I don’t appreciate the dishonesty. I’m glad that they are trying to improve the quality of their manufacturing and seem to be paying lip service to their old manufacturing location… but deceit at any stage of the life of a business is unacceptable and makes me distrust anything they say going forward. Thanks for reviewing the better MTM options. A few people have commented that PJ style is more a young man’s look. Maybe, but as a 64 y.o. Sydney PJ client, I have been very happy with the style and have found it perfectly appropriate to my age. Its appeal lies exactly in the fact that one can dress well yet with a relaxed feel to which people respond very positively. MTM pricing means one can afford to build a range of different seasonal items and afford occasional errors in fabric choice (although I have found PJ staff very adept in gentle guidance). With respect to the criteria set forth by GONZAGUE, above, how does Orazio Luciano MTM compare; that is, collar attached by hand to the lapel, hand padded collar and lapel, and hand rolled lapel? I know OL reaches into the less expensive bespoke pricing range, but also adds lots of handwork – I am curious. With respect to SuitSupply MTM, also mentioned above, I think it makes a good product for the price, but its Neapolitan emulation, I believe, falls slightly short. It seems to me that it takes its stock suit, increases the lapel size and removes the shoulder padding, leaving an excess of material “bunching” on the shoulder, unlike authentic Neapolitan which tends to hug the shoulders through active movement (Since so many of your readers love SS MTM so much, would you consider doing a commision with a SS “Neapolitan” suit?). Also, the armhole isn’t comparatively high – as my little brother, who swears by SS MTM, discovered when he tried on my Solito. Also, its quarters are not rounded enough, which creates an unbalanced look with the wider lapels. But again for the price, it’s a good and well-respected Chinese-made product. Finally, while you’re best to judge the fit of the PJJ, it doesn’t appear to be bad in any respect. The jacket is so casual-looking that its shorter length becomes a non-issue. I have had suits made by P Johnson Tailors – a few years ago. I was told the suits were made in Italy and shirts in the Netherlands on a number of occasions. My new tailor told me they actually are all made in China to date, the higher end and diffusion line in the same factory. Now we all know there is nothing wrong with made in China, they make amazing stuff but please don’t try to trick your client. Now you say they are going to Italy? Maybe they had a time machine for my suits. No authenticy. What we have here is a brand – not people who care about craft. That’s the reason I don’t go there anymore. Fit is another issue. I’m sorry this is a tad negitive, I do love your site Simon – keep it up. As both a long-time reader and long-time customer of P. Johnson (Melbourne), I found this particularly interesting. To share my own experience, I would echo Ben’s comment re being pushed towards alterations. I’ve now had 4 suits, 2 jackets, 2 trouser made (plus many shirts). For the most part, I think PJ have delivered an outstanding product at a good price, and their quality far exceeds their competitors in Australia. I’d say I’m content with 3/4 of my purchases. My less-positive experiences have come with more junior salesmen. One jacket in particular was miles off. I reluctantly settled for alterations and some halfprice shirts when I really should have had insisted on a complete remake. The result is a (barely) wearable jacket with no balance that hangs horribly unless buttoned. That being said, I think their shirts are excellent value, and Tom Riley (one of the owners) has always been such a pleasure to deal with that I will continue to use them whilst I am located in Australia. I’d agree – I think the value for money is excellent and that I’ve been happy with most of my commissions. However, they do struggle to fit non-standard frames (I’m only 5’10” but have a broad chest and a narrow waist) and you don’t get the impression that they are willing to send the garment back to be fundamentally altered. The shirts, in particular, are excellent value. Unfortunately here in Australia they are known for misleading people into believing they were tailors and all made in Italy. They even say their fitters are apprentice tailors (my guess is so they can pay them a lower wage). I think they have their own style which they are known but with all the misleading and the lack of transparency I would never recommend them. As others have pointed out, this seems like a more expensive and inferior product compared to SuitSupply. All my suits are now bespoke, but I started out with SuitSupply RTW which I still think is amazing value. 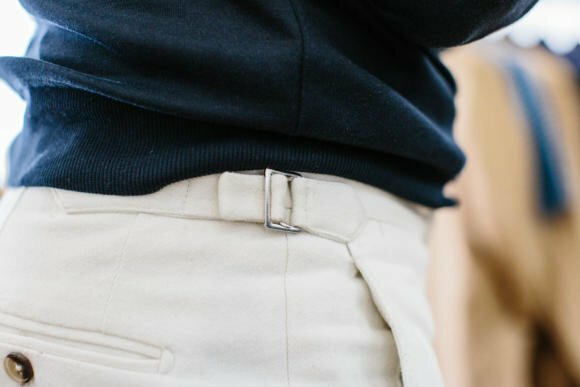 I still pick up their Soho Slim Fit trousers (now renamed Brescia Slim Fit) once in a while as they have a proper rise, flattering siluoette and are very decently made in good Italian fabrics. Would it be possible that you also gave SuitSupply MTM a try? I’m sure your readership would appreciate your unbiased opinion. On another note, do you plan to do any follow up posts on Graham Browne? I think it is definitely time to do so given the developments there (coat workshop, improve basement workshop, quality improvements etc). Even though it is not quite the same tier as most of the things Simon reviews, I would also very much like to see a review of Suitsupply MTM! I would also very much appreciate one ! A business build around lies then. These are not designers or tailors just salesman. Also Mr Johnson is always photographed wearing Knitwear over his shoulders instead of a scarf. To me it’s stuipid. Get a scarf. Unless you just played tennis. My experience echos the above. A little side comment away from the jacket and trousers here I am glad to see the loafer now being offered as an actual model now (To my knowledge its available as MTO) As there is nothing else like it. I would love to see an updated piece on them, how they have worn, how versatile they have been etc. Although we see them in many, many photos not much has been written about them since they were commissioned. At the funeral of Jack Cohen a guest was amazed at the numbers attending only to be told by a fellow guest “Well give the public what they want…”. I am reading a book on the film studio greats at the moment! However delighted to see so many comments on this article; if nothing else it proves that your public is interested in MTM. Thank you Simon for the review, I thought it interesting and as usual very well balanced. The style really isn’t for me but I guess for a twenty something with a 30 inch waist and 40 chest it would look fine; alas I am the reverse and need all the help I can get. I don’t know if G&H still do MTM but about ten years ago I had two of their suits and was impressed. I am also very interested in what Mr Mahon of English Cut is doing down in deepest Marylebone with his MTM. Considering his A&S background I am always slightly surprised that you have never had a suit made by him. Any chance of you popping down to his shop and giving us your opinion on his new line? I did cover the Gieves MTM a while ago – it was ok, but not great. As I understand it English Cut entered administration last week. Oh dear. Reading all this makes one think perhaps tailoring should be consigned to the dustbin of history. Firstly just read all the comments to see the problems with fit. It just seems close to impossible to get a decent fit in a suit. Second when you change size the fit is thrown off. Thirdly it’s expensive as hell and most regular people can’t afford high quality tailoring meaning this desperate hunt for someone who can do X, Y and Z below a certain price. Life just seems too sort. Sorry to be negative but I stopped wearing suits and jackets 2 years ago and couldn’t be happier. Thanks Rups, though I’d disagree on these things being hard – 90% of people reviewed on the site here have been perfect in execution. Having a bespoke jacket made is a distinct and beautiful pleasure. Whether it’s affordable or not is also a matter of perspective. Buy one a year and plan it into your annual budget, and appreciate the fact it will last for decades. I’ve only had 1 suit made by them several years ago, it just adds to the further comments above. Bad fit and pushed into alteration. I only write this to help fellow readers when picking a tailor or mtm company. The issue I have seen and fellow co-workers have experienced with PJ’T’ is we all thought they are all tailors. Some had good experience some had bad. When the company first started and even now in Australia, Most Aussies don’t know a thing of mtm/bespoke tailoring or even RTW suits for that matter. Just a good brand with a strong social media presence attracted a lot of my colleagues and even myself(foolishly). After prices skyrocketed for PJ’T’ MTM only due to popularity in Australia anyway, actual in house made in Australia tailors such as Zimmatailors which in my experience was absolutely amazing provide far better value for a couple hundred bucks more. The suit I had made by Roger(zimmatailors) recently was semi bespoke. All by hand & only the canvas was attached by machine & costed AUD$2000. Zimma Tailors is definitely not made in Australia. Roger just opened a new factory in Tianjin in China. Not all his suits are made in China. Not sure about the new shop as I’m not a Sydney local but I’m sure you’ve been in his old shop, workshops upstairs. Curious, would love to know if you’ve had a good experience with Roger as well? All his suits are now made in China. Previously, he told me he used a factory in Italy but not anymore as he claims the construction from his Chinese factory is just as good (if not better). I don’t believe any of the suits were ever made on site in the workshop upstairs. I haven’t bought anything from him as of yet but I had a lengthy conversation with him about his products. My two cents: The workshop upstairs at the old Ivy shop was used for small alterations and personal projects for Roger. These personal projects would be photographed for his webpage and social media, usually with him with thread and needle in hand, tearing basting thread or chalking out patterns on cloth. It is my understanding he was running a MTM operation, selling it as bespoke and pointing to hand finishing such as the Milanese buttonhole as evidence. I am also aware that his fittings were alteration sessions on completed garments although I am aware for a few customers they did actually did fittings without sleeves to get pitch more correct (even if the chest pocket was already finished!) I am not acquainted with his current offerings at his new locations save for the fact he is offering a few levels of manufacturing and it appears it would be approaching bespoke in that the garments (only lounge suits and shirts though) should fit better as there will be more fittings (or at least check points with the unfinished garment and client in person) Yes there is more transparency as to the construction being offshore now however I would say the information on the website is more sales pitch than informative, but given the need to drive sales in a free market, and the lack of education in these areas here in Sydney it can hardly be blamed. I would say his strengths lie in his eye for colour, patterns and cloth… would I personally purchase something of his? Probably not… although his price points are attractive. There are plenty of true bespoke options in Sydney, just Roger isn’t one of them. If you’re after good value bespoke in Sydney you should try Patrick Oh of Luxius on Pitt St. His father is a master tailor based in Seoul, Patrick does the fittings in Sydney and the manufacturing happens in Seoul. I’ve bought four or five suits from him in the last 18 months, he’s a pleasure to deal with, the quality is good and his suits are very keenly priced. Hi Josh, I am a sydneysider looking for bespoke suit. I had planned to visit PJT to get a suit only to realize now that they don’t do bespoke suit? How would you say the about the value of Luxius suits? I’d appreciate if you could share some of your experience. I am looking to buy sth under 2k. Is that not possible for bespoke suits? Hi, Luxius is the best value I’ve found in Sydney. I’m pretty sure Patrick does bespoke just under $2K but it’s with entry-level fabric. If I was looking to keep it under $2K I’d go for M2M with a decent fabric I think. Give Patrick a call and go and see him yourself. I am currently commissioning a bespoke suit from Patrick from Luxius in Martin Place. My first fitting will be in 3 weeks, happy to send you pictures of the results. Long time follower here Simon, and first post. Huge fan of your writing and the blog. Another very helpful review! Just to add what others say – covering mid-market MTM is great for persons such as myself who do not have the money – or necessarily the inclination – for bespoke. Somebody above asked about MTM in London; Emmett Shirts do a fantastic soft-tailoring service downstairs at their Jermyn St shop in the Neapolitan style many of us love. I had my first MTM suit there a few months ago and couldn’t be happier with the outcome, service and value. Emmett produce their MTM from the same Chinese factory as Patrick Johnson, I compared the insides and they are completely the same. Emmett are a shirt makers whose shirts are made by emanuel berg in Poland who do make a fine shirt. The Emmett suiting i have been told is made in Italy but i am doubtful about this as after reading that P Johnson previously worked at Emmett.. would anybody be able to tell me for certain where my Emmett suit has been made?.. i fear i have been lied to..
Aside from how good this blog is , as demonstrated by the above review , it is a testament to your work over the years that the comments are so enlightening! Sometimes I feel we lose you to £2000 Italian shoemakers. But alias those of us that keep faith are afforded these kind of affordable /mid market reviews. Just reading the comments it is apparent how much more light needs to be shed on the MTM market which is dangerously heading towards the ‘buy the brand/label’ end of things. If these MTM people want us to be measured by “commission employed young salesmen” then sorry I’ll just get the wife to measure me. Surely they should realise its all in the measuring . A quarter of an inch here or there is enormous ! I think a degree of naming and shaming is needed of these ‘exploiters’ by comparing them against a Suit Supply off the rack or a GB bespoke. And please, please don’t let us lose you to the luxury end of the market. I am with Robin here. GB is a real bespoke tailor that just does some of the sewing by machine rather than by hand so as to keep its prices at the level its traditional City customers expect. If one wishes to experience how tailoring shops were in “yesteryear” I would recommend readers to pay them a visit, especially on a Friday afternoon. They’ll be having beers with the cloth merchant reps, customers etc. Old school London feel to it. One of the few “authentic” places left in London, as Savile Row is turning into flashy RTW stores more than traditional tailoring shops. For the rest of us, who is GB? Simon, a good, decent and impeccably fair review – though a tad disappointing to read of negative comments re. Australia. Worth reviewing for those on a restricted budget and the point about the trousers being value for money is well made. 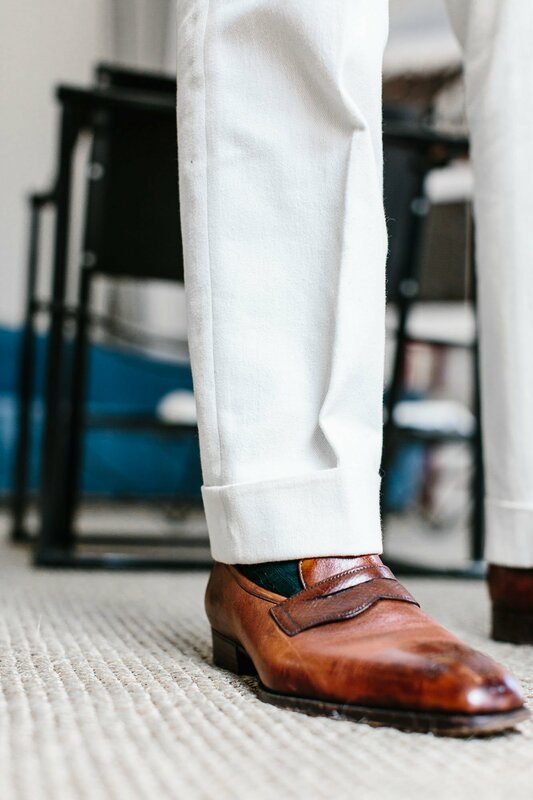 However it would have been great to see the linen jacket matched to the cream trousers (a natural) vs. the grey trou which looked ill matched (not due to colour but cloth and style) – just a thought. As a long avid reader since inception, and having made certain purchases based on your review, such as trying Cerrato as an alternative to Ambrosi, Solito and other makers, I have to say I am extremely disappointed to see PJohnson mentioned on this site, as I, like many other readers, believe PJ to be the exact opposite of what this site is about. Giving you the benefit of the doubt as you may not know much about the Australian market or makers. But you are incorrect in stating that merely PJohnson’s salesmen have been misleading customers. . In most of the articles, such as The Australian, Patrick himself states that We’re offering a suit that has every buttonhole, every topstitch, everything done by hand in a super 130 wool, completely tailor-made in Italy. Those are from about $1700 — that’s unheard of in Australia. 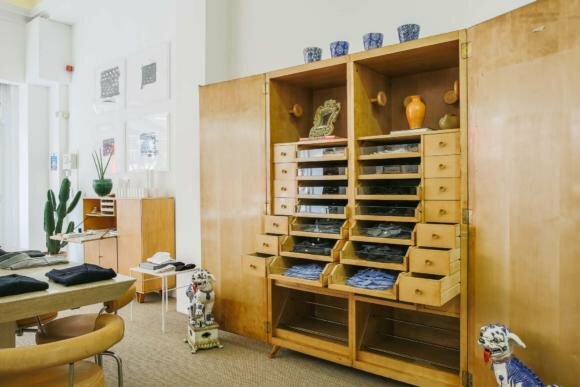 (http://www.theaustralian.com.au/life/wish/bespoke-tailor-patrick-johnson-wants-men-to-feel-at-home/story-e6frg8io-1226944396229). Us Aussies are not educated consumers and don’t have the resources of our other international counterparts. However, he has misled his clients from Day 1 about where his product is made, and most uneducated clients are led to believe their whole suit is hand made when it is machine made in China. Quality aside, his interior design, colour schemes are great and fit Mr Porter’s fashion image well. However, I believe this blog is about integrity and preserving our culture and expose new artisans for the world to see. PJ is none of the above. Great to see some commenters aware of this sham company. While I love Simon’s blog, I can’t help but feel he is being used by P Johnson into correcting the negative press they have been getting about the lack of transparency on where their products are made and deceiving their customers. As per the article, Simon says they are moving all their production to Sartoria Carrara, which is completely false, PJ have 5 showrooms around the world and get about 30 customers a week in each showroom, that is thousands of suits a year and the tiny little Sartoria Carrara can in no way service that many suits, it’s just a marketing ploy! I’m pretty sure only their top tier stuff is made there, which 99% of their customers don’t opt for, so the vast majority of their suits are made in China. Italy also shuts down for August, but P Johnson doesn’t, so I wonder what happens when Italy goes on holiday? Oh that’s right, they just continue to make their overinflated suits in China, where they always have! I’ve even purchased from them in the past, regrettably, from P Johnson and Suit shop, their cheaper affiliate, and the product is exactly the same cut, same hidden internal labels, everything! Their staff are even told to remove the tags before giving it to the customer, so that it doesn’t appear to come out of a big factory and is all handmade. None of their products are handmade and the fact that they state that it is just really grinds my gears, they are exploiting the poor bloke who knows little about tailoring and is getting an inferior product for a product mass produced in China. They are good marketers, I’ll give them that, but it is built around lies and deceit and that just isn’t on nowadays, people deserve to know what it is exactly they are paying for. The lack of integrity behind this brand to just make vast amounts of money at the expense of the consumer, so that the founder can swan around like a pretentious tw@ is just plain wrong! I don’t think Carrara is a tiny sartoria. If you have a look at google satellite picture you find that they are situated in an industrial area with big buildings. Maybe a factory visit would make things clearer. I’ve been to sartoria Carrara, there are very few large scale factories in Italy that can service thousands of suits a year and the ones that can are owned by the likes of Kiton, Cesare Attolini, Brioni etc. Sartoria Carrara can in no way service thousands of suits a year, you can even see in P Johnson’s marketing shots on their Instagram that there are about 4 workers in the background, how can 4 ladies make thousands of suits? and as per the message below where they responded to an enquiry stating their suits are 85% handmade and then their Napoli range is 100% handmade is complete garbage! None of it is handmade, except for the buttonholes and pick stitching, simple aesthetics that make no difference to the longevity and design of the jacket, which is the sole reason for doing a hand padstitched lapel for example. Simon, I also know people who have worked at P Johnson and other MTM suiting companies in Australia that see P Johnson suits rolling off the production line in China, and in their sydney showroom the P Johnson and Suit shop gear arrives in the same boxes, with the same labels, same everything! Suit shop and P Johnson are all made in China, let’s leave it to P Johnson to prove that all their suits aren’t made in China, because there is a lot of chatter that they are and where there is smoke there is fire! Well, I don’t think that last line is that helpful – often sites and forums jump around a lot at smoke, and conclude the whole world is ablaze. But the information on things coming directly from employees is helpful information, thank you. Thank you for your enquiry and for considering P. Johnson Tailors to make your next suit. The prices for our suits depends largely on the cloth and the finishes selected and we have a fantastic range of cloths from the Italian cloth houses of Ariston, Delfino and Loro Piana to cater for all your business and casual suiting needs. All our made to measure suits come standard with a fully floating canvas and prices for a two-piece suit range from $1350 to $2000. Our casual separates start from $900 for sports coats and $385 for cotton trousers. We also make business and casual shirts starting from $225. The PJ Classic Line made in Rome is 85% handmade. The PJ Roma Line also made in Rome and the PJ Napoli line produced in Napoli by Orazio Luciano are both 100% handmade. 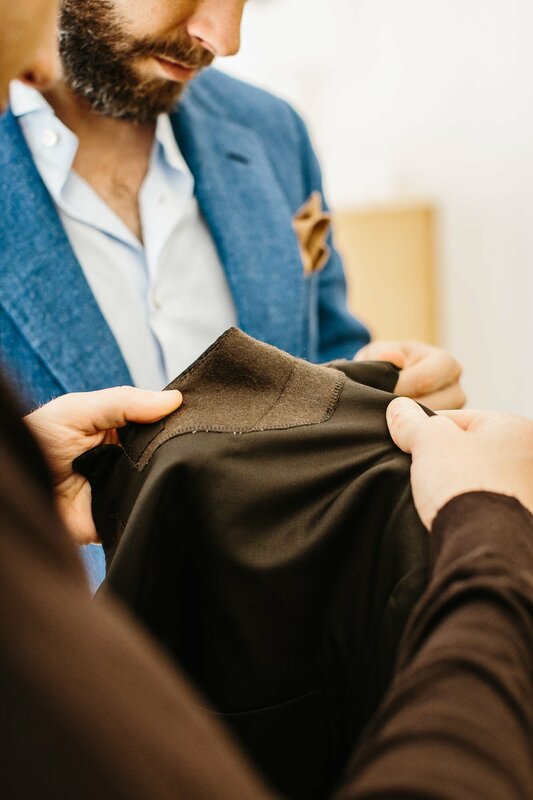 During your initial consultation and fitting appointment, you will have the opportunity to look through our cloth selection and discuss the details of your suit with one of our tailors. You will then be fitted and measured up for your own suit that is cut to your individual posture and physique. We keep your measurements and suit pattern on file so if you ever need to order more kit, its as simple as coming in and choosing a new cloth. 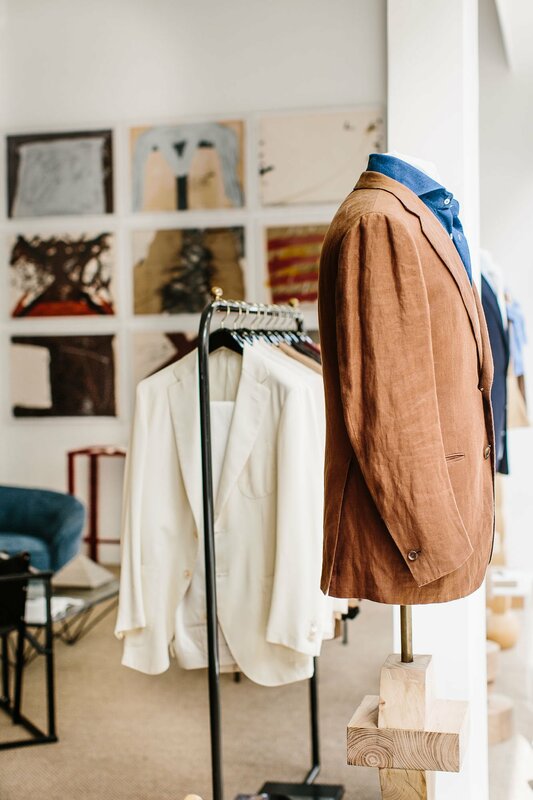 The appointment takes approximately an hour including a first fitting and a consultation, although we do also have a 30 minute appointment if you simply wish to have a cloth and suit consultation without the fitting. We can show you examples and best advise on which cloths will be appropriate for the end-use of your suit. Our suits take approximately 6-8 weeks to arrive once your order has been placed. We then arrange for your second fitting where we make any minor adjustments necessary. The suit is usually ready within a week to take home and give a good wear in. We usually take a 50% deposit via EFT or credit card at time of ordering- the rest of the balance is payable when you take your suit home. Please do not hesitate to contact me if you require any more information about our services or if you would like to make a booking for a fitting at our Melbourne or Sydney showroom. We take appointments from Tuesday to Saturday. If you would like to book in for an appointment, please provide me with a mobile number to place on the booking and also whether the appointment required will be a half hour consultation or a one hour first fitting. I can vouch for this users experience. I was told the same thing. Including that their classic line was made in the Netherlands. I have since been told first hand by employees that those lines were always made in China and were never made in Europe. My experience is from PJT’s cheaper off-shoot: Suit Shop, from which I’ve purchased a number of items over the last 3 years. I have two 3 roll 2 SB jackets (roughly 450 GBP each) and one DB suit (roughly 730 GBP). I also had an MTM denim shirt made (150 GBP or so). Jackets are half-canvassed, with various minor modifications made for my frame (longer jacket length, dropped shoulder, longer sleeve). Pants were pretty standard, but slightly higher rise. Pants drape nicely, but a little pocket flare on first fitting. Shirt was a little tighter than I’d like, but only marginally and not really requiring much in terms of alterations. Jackets have been good without much change. The main point I wanted to make was that I don’t recall any of the staff I’ve dealt with ever suggesting that my kit was made in Italy, the Netherlands or Portugal; they were pretty clear that it was coming out of China and that the higher price-point PJT kit was done in Italy… from memory (though I may not have paid much attention to the PJT response as that’s not in my price range). My jacket fit was also pretty much nailed first go and the two fitters I’ve dealt with generally gave good advice regarding fabric choices and options such as pockets, buttons and lapel width. I have heard rumour that all manufacturing was going to Italy (their Carrara workshop), but that didn’t come from PJT/SS staff. Doesn’t sound very likely in terms of cost, but I’ll be interested to confirm that when I visit in the next few months. The Cloakroom, in my opinion, is a much better option in the Australian MTM space, and Zimma Tailors for bespoke and RTW. Both businesses are upfront about provenance, levels of handwork etc. and deliver a superior fit and quality of make. Thank-you for an honest, unbiased review Simon! Should fashion/menswear/clothes … call it what you will, be not about showmanship, or superiority, but about feeling oneself in what one wears? Style comes from the confidence and comfort (not sweatpants) that you exude when you feel good in what you wear, does it not? I was one of those Australians, unaware and uneducated about the world of bespoke, MTM and the many details of finer menswear. I dressed in department store clothes, poor suiting and ‘the usual’ high street mix. Because, that’s all I knew. I had a tux made by PJT and now have several suits, trousers, knits shirts etc…. I’m not a staunch brand loyalist, but I can honestly say that it has helped me dress better, discover and explore my own sense of style, and condense my wardrobe from a large amount of rubbish into a more concise, almost capsule-like cupboard. I feel good getting dressed. Now, I know I have the tendency be brand snobbish at times in other aspects of life, but I know that my PJT items are not the be all and end all. I Yes, their after sales service can be lacking…. 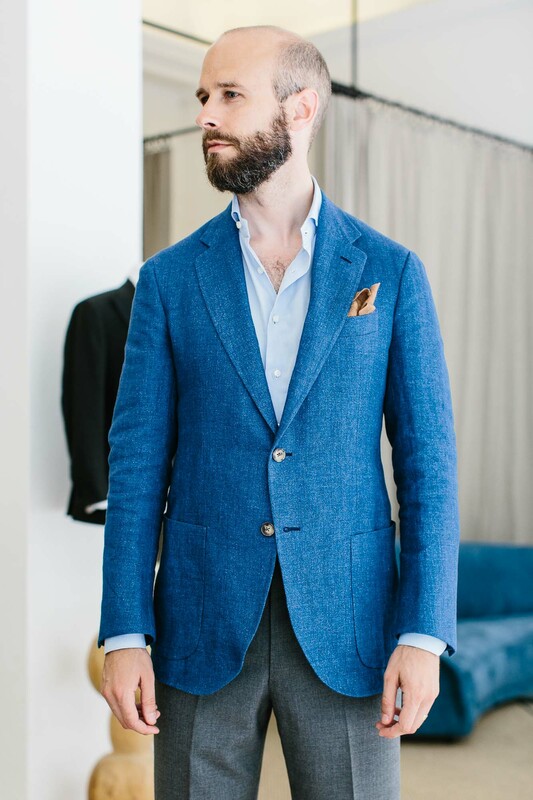 the lapel roll isn’t quite what my ideal is and also one day I’d love a Cifonelli 3-piece when I can afford it …. But, ill always be thankful that someone out there has helped young men (at least this one) dress better… isn’t that a form of good manners after all? I love your site but have to say, I don’t find too much of merit here. It all looks a little ‘ not so cheap but rather cheerful’. I would have thought that from a PS perspective P Johnson is more GQ readers fodder. Personally I would prefer that you take a more solid look at the likes of Sexton and Zegna MTM and see how they have progressed. Also, more commissions from the greats should remain the bedrock. No, that is unfair to the majority (i would imagine) of readers here that enjoy fine menswear are not in as of yet a fortunate enough position financially that cant afford to be speak Cifonelli, CdL, C&M please please please keep these types of articles at this sort of price point coming. The level down. Don’t you mean several levels down? I for one would be very interested to learn what they thought of your review? The review and subsequent comments have been very interesting and a good read. Everything is fair dinkum (preferences on style, quality of MTM v bespoke etc.) but I am really concerned about the claims about dishonesty and false advertising. I was hoping if you could send a note to Patrick Johnson to give him a chance to respond to these severe allegations of dishonesty and false advertising… the comments about Carrara factory being too small to meet the demand from 4-5 global showrooms (and that the bulk of the PJ suits are still being made in China) is really really CONCERNING. It would be really appreciated if you could help clear these statements… not all of us can afford Bespoke unfortunately. Thank you. Love your work mate. Manufacturing provenance aside, the trousers look good. Contrary to bespoke, the MTM margins are simply too good to resist for most of these guys and can form an integral part of their business model. However, I doubt that is what is driving Mr Johnson as he is evidently a wealthy man in his own right. His vanity project is a bit of fun and his marketing is spot on in every aspect. It’s easy to see how customers can be lured into his wife’s artistically curated showrooms or attracted to a life of detached, idle wealth; both of which are synonymous with the lifestyle brand. But, he is also educating younger guys out there and he should be, in part, commended for that. I don’t we can brush off clear lies as marketing. Fine if they don’t want to discuss where things are made, that’s their right. But, to outright lie to a customer to make a sale is not just unfair, it’s illegal. Also, this isn’t a vanity project for Patrick, this is his livelihood. And the motivations for his business don’t in any way justify lying and deceiving people. Well I suggest you return the vast majority of your “Made in Italy” items immediately! I was also lied to about my 6 suits. It’s not an issue but now I feel like I was conned. If I knew it was made in China I would not have cared. I discovered all their suits are made in China and the owners told me otherwise a number of times before. Also, my friend told me that their Italian factory was purchased by the company that makes their suits, not them. Imagine that. Lie to us, fine but lie to our leader Simon……then we got problems!!! The RtW on Mr. Porter, is hideously priced. He’s a great ‘model’ for the brand he represents and part owns but I wonder how the tall dark and average man will look in it. Yes, although most brands would have a mark up not too far off from their own effectively wholesale cost. Your review was fair – no issue. However, upon reflection I must raise something that’s been irking me for a while; you review sectors such as these and often refer to GB as baseline for value (for comparison in the comments) but the truth is there are many tailors in London (and outside) that give value – its just that you haven’t bothered to review them or commission from them. Your position on this is therefore weak as you argue from a position of having no direct knowledge of these areas. You will know that over the years many commenters have mentioned them (Merrion et al). On one occassion I entered a list of around 20 regional tailors in the comments. Over time you have moved more to the luxury and fashion space – as this article reflects – but it also moves away from the sense of style that many smaller tailors produce every day. You do them a disservice and, perhaps, are treating them in the way that Lobb’s once treated you? This issue is raised occassionally by commenters but it is really something you must deal with if PS is to retain a sense of validity re. the bespoke offering in the UK. Thanks, and I appreciate your points. I didn’t actually raise Graham Browne, it was one of the readers. I don’t use them as a baseline – they are merely a handy reference for readers of the site, as I have covered them in the past. I have certainly moved to more luxury pieces and tailoring since the beginning of the site, and therefore the cheapest bespoke is not something I cover very often. Also, there hasn’t been any suggestion that the regional tailors outside London do anything different that GB or other cheaper bespoke tailors do not do – whereas many of the Italians I cover, or MTM businesses like this, are. These are the main reasons I haven’t spent time looking into the regional tailors – though I still intend to. It’s also worth saying that this is not necessarily a British blog. Only 36% of the readership is in the UK – and as you can see from the comments from people in Australia and the US, covering a brand or tailor that travels internationally has more potential to be relevant to a majority of the readers. Hope you’re having a good weekend. Please would you do a review of Souster and Hicks in Luton? I met Geoff Souster about 20 years ago when studying, he seemed so knowledgeable. I don’t know what you guys are all talking about. Patrick Johnson is one of the best Chinese MTM suiting brands out there. Checking the careers section out on PJT. They are looking for apprentice fitters —-> Our apprentices are expertly trained to fit custom made suiting using the Savile Row method, acquiring a unique, traditional skill set. What a load of $hIt3. This lot are are just traveling salesmen with a tape-measure around their neck. I’ve finished my coat making apprenticeship on one of Savile Row oldest tailoring houses which took 4-5 years. It just completely undermines the actual trade & my training. This lot are Mickey Mouse. Well, two of the staff in the London shop have or are attending Andrew Ramroop’s school. Which, whatever you think of it, is on Savile Row and is taught by Savile Row trained people. I agree with the commenter above, none of their staff are genuine tailors, even Patrick claimed in numerous interviews in Australia that he was trained on savile row, which just ads to the other web of lies this company has spun. In truth, Patrick worked at Emmit, which is no different from working retail at TM.Lewin. All their staff in Australia are practically right out of school and even their recruitment ads in Australia state that no experience is necessary to join their team. They have also stated in interviews, that they prefer no experience, so though can mould them to suit their company, in other words, train them to spruke the bullsh*t they tell their customers regarding fit and product construction, including country of origin and how the customer should get their suits without canvassing as it’s lighter, yet the pricing for that is the same or even more than suits with it! It’s like buying a car without an engine! None of the staff actually have any clue about genuine tailoring and are quite literally baristas with tape measures around their necks. They put on a good show tending to the clients with coffees and drink etc, which seems to dupe the vast majority of Australians that have no idea about genuine tailoring and seem to enjoy the experience, but I have no idea how any can believe the crap that they hand make their products, when they herd in hundreds of clients a week in each show room and make them in factory in Italy which is known to have less than 50 employees and also makes for other brands, its not possible! They use the big factories in China to serve the majority of their clients and the Italian one for the customers that pays $3000 for their top of the line range. are you just echoing other commentators? Or do you have a reliable source to your claims? Would love to get to the bottom of this. I do have a reliable source @OAKTREE, I’ve used Munro tailoring myself as a supplier and have seen the production first hand and lo and behold, P Johnson stuff was rolling off the production line in China. Can you please explain what Munro is exactly, and whether you mean to say that they are making the same clothing as PJT. I’m really hoping to hear more about this. Simon you must deal with facts. The courses Andrew run vary in length, the longest being 10 months. Why would you even raise it when the poster above is talking about apprenticeships which last years. Your whole tone sounds as if you are trying to defend these people. Thanks. I am not trying to defend anyone, just maintain balance and in fact steer towards facts rather than opinion where possible – which I’m sure you’ll agree, hasn’t been there with some of the comments. I am aware there are various lengths to the courses, and that none anywhere near approach a full Row apprenticeship. The quote included above doesn’t say they are Savile Row apprentices. It just says they are PJT apprentices, which could mean anything. Though I can see there could be an attempt there to link to the idea of a Row apprenticeship. I think Andrew’s course is great. I was ready to do it myself, but the course length is only 10 months. It takes years to master this trade. You could think of it if you went to car dealership and the salesman was telling you he could build the engine in the car as well as sell it to you, also telling you it was hand built in Germany when it is knocked up for cheap in Deptford. Absolutely, the two are not the same at all. But the course is clearly what they are referring to, and from what you’ve quoted, it is pretty accurate. They are expertly trained, using Savile Row methods. Though the use of the term apprentice could be a little disingenuous. It was YOU who made the Sedwell link, as if it gave them some kind of credibility, thus excusing some of the rather damning comments made about this outfit………..
You are loosing your focus, and sadly it is beginning to show. I’m afraid it’s obvious you’re not interested in a substantial discussion here, as the personal attacks make obvious. Training with Andrew does add some credibility. Suit Supply salesmen do nothing of the sort. It is clearly not the same as Savile Row bespoke, but that is something PJT have not pretended to be. The comments here, also, have been about quality and honesty, mostly, not about fit. The fit, for what it was, was good. Useful not to conflate the different points. Whenever possible opt for bespoke. It is unbeatable in quality, fit and personality. It is the only way how you know the person who is taking the measures, cutting and sewing your suit. Your tailor will do changes until you are totally satisfied. Aftercare lifelong is part of the deal. Better having only a few bespoke suits as a closet full of junk. If you choose MTM make sure that you find tailor trained personell taking your measures. Know where and how your suit is made. Avoid fancy showrooms and better double-check the maker of your suit. Don’t forget that this blog claims to be the ” leading blog on bespoke, craft and luxury”. Some chinese underpaid working slaves will not produce high quality garment on the their sewing machines. ** disclosure: I live in Germany an Italy. I have some suits made from a Germany based and in Germany producing MTM firm and suits from my italian bespoke tailor entirerly handmade. I’d still be very interested to know what P Johnson him self or one of his representives think of your potentially devastatingly honest review – surely you ran it past them before posting it here. No, I don’t allow anyone to read my articles before I post them. But I did let them know what its conclusions would be. I don’t think the average Joe will worry too much about the negativity. I’ve seen people nitpick the finest tailors, shirt makers, shoemakers etc and nobody is ever 100% satisfied. I had a terrible experience with one of England’s best and most famous shirt makers but I doubt most people would care. Ps., Simon, I found a great denim shirt from Borelli….I say great….that’s how it looked. It’s being sent as I type this. If you’re in Australia and have been lied to about your product on a number of occasions like me and maybe you have heard from friends about PJ cutting off Made in China labels from their garments to trick you into thinking its made in Italy, this is the appropriate channel to complain. Please see the link. Complaining here is a waste of time. They can just ignore it and carry on. This is actually quite serious, as mentioned above imagine if it was food, or your car. What’s the difference. Has the company not given you anytime or offered a solution? Ah right, so what you’re saying is that it’s ok to lie to your consumer and fake where your product is made for years to get an extra buck in business if no one died. That makes sense. Sounds ethical. I just never went back when I found out. I guess if I got a sorry not then it’s fine then? Any other business at this scale who would fake a product or service would get in trouble but fashion is ok? Simon, as a frequent reader and admirer of your blog it does appear that you have stepped into rather deep waters here. As a frequent visitor to Australia I am familiar with the company and their marketing. As many posters have pointed out their base market is unfamiliar with the basics of tailoring which has no doubt created some egregious errors on style etc. More deeply the oft repeated origin of manufacturing issues cannot be ignored. Thanks Russ. I have asked whether they want to do so. Morning Simon – just catching up on last weeks posts with my morning coffee. Gosh I bet you are pleased you decided to check out this company. I haven’t heard so many complaining Australians since a certain Jonny Wilkinson kick a few years ago. However can I just add a further two pence worth? Not so much about MTM v Bespoke or this company but about the local tailors. For the craft to survive into the future I am sure we all agree that a ready pool of young talent is needed. For some that involves joining a training scheme at a major house or attending a course. But for others, who may not want to travel or can’t afford to live in London joining a good local tailors can provide value, an opportunity to learn the basics and if the individual enjoys the experience then move into a London house. In many respects this is what Mr Mahon did when he moved to Cumbria and created his apprentice scheme. To say that this is an international site is absolutely correct but with that power comes a certain amount of responsibility. I was introduced to GB through this site and I am sure that their international work has increased from all those early readers who thought they were worth trying on your recommendation. From what your UK readers are saying it would seem we have some diamonds in the rough outside of London. That may or not be so but if you recommended one then I would certainly try them out and I am sure some of your international readers would too. For instance I had a wonderful experience having a morning coat made by G D Golding in St. Albans. These may not be well known to your readers, even though they, like G&H hold Royal Warrants. A traditional tailors producing traditional English cut clothing. I would recommend them particularly for formal wear – and when you get the Knighthood for services to tailoring Simon you may well need a morning coat! Thanks! That would be pretty special. Points taken, thanks John, and I will try to do so. I would be interested in your review of Bespoke Bijan (should you ever visit the antipodes) in Sydney, Australia. I can imagine the logistical nightmare of him being located so far from you. Have heard plenty of great things about him from forumites on the london lounge and other sites. He apparently worked at Huntsman for some time and was a master tailor at the age of 16! On the cloth itself, what do you think about having a casual cloth in a formal cut, the trousers specifically. Will they maintain their shape / cut? What other considerations need to be made? I’ve had a pair of trousers and two shirts made by P Johnson Australia, every single one had issues, and two of the garments had to be remade (and I should have had my first shirt re-made as it is just too small, and I do not wear it). I would never go to them again for a shirt, but their trousers are okay if you’re lucky with the fittings. As a world leader in bespoke, craft & luxury, Permanent Style seems to be off brand with this review, as the P Johnson brand & the quality of their products are neither of the above. I find most articles to be valuable & inspiring and the site to be a great source of information…all things which I just don’t get from this article. I can’t deny it’s entertainment value though…Regarding all the smoke around customer deception & fake provenance…If it’s too good to be true, then it probably is…£1100 might be great value for a mtm Italian made jacket with hand finishing…but is it great value for the Chinese version? I found the review, overall, quiet disheartening. First of all, any transient reader is well-aware that your website Simon overwhelmingly favours bespoke garments. It didn’t make particular sense to then try on made-to-measure garments which were not of your fitting. You clearly saw the stark differences between a bespoke-made and a hand-finished garment. Look, to point out, quite clearly, that those who have taken the time to give a negative review or raised negative comments about the P. Johnson business haven’t had a pleasant experience. And I can’t help but feel that they have been wronged by because they haven’t understood the product that they were going to receive. For a person who has had their garments made by Patrick more than a decade ago, they understood where their products were being made. And it wasn’t a matter of every single person to know for public knowledge where they originated from. This is an undisclosed conversation held between the tailor and the client, only. No one person wishes to misled anyone here. But it seems that for people that have only been acquainted with the company for the last couple of years, that their own belief where their garments were intended to be manufactured, they were misinformed. Patrick always offered hand-made garments. But he never stated they were bespoke in the traditional English sense. Two were hand-finished, with traditional machine use, and the last a fully handmade model from Italy. All of which were faithful to the Neapolitan style of Italian tailoring. It was only until Patrick began offering the Suit Shop venture, that garments began being made in the Far East for the economically-priced consumer. To that end, I thought it was an unfavourable review. Patrick then has to sent his own personal reply to what he might perhaps think is bringing his company into disrepute. It’s an incredible shame the discussions of which are I might add are online-based (for which we won’t ever actually know who these anonymous people are, who appear very acrimonious about their suit experiences with Patrick) have led to such cacophony. Made-to-measure, like bespoke, is a personal experience. Not one for the masses. P Johnson isn’t for every single person, nor is bespoke. I think you are incorrect on a few points. From the beginning Patrick had been dishonest. He began his company by saying it was all produced in Netherlands and then Italy. This was never true. He never made any of his garments (besides the resold Orazio product) in Europe. It has always been China up until Carrara (last year or so) This goes on way before Suit Shop. Suit Shop was the first time they were honest about Chinese production. So how do we know if all his PJ suits are currently being made in Carrara or not? If he has lied before, he could still be lying. How can anyone trust buying anything from P Johnson again? I guess Suit Shop for $1200 AUD is worth it for Made in China but $2200 AUD for “Made in Italy”? Not anymore. The brand has been completely destroyed and I think many Australians who previously respected the name “P Johnson” will definitely agree with me here. Looks like the MTM Crown & Throne has been free-ed for someone else to take… Please we need a legitimate tailor to set up shop in Australia. There is Bijan, J.H.Cutler and Leng Bespoke who are all legitimate tailors, unlike Patrick Johnson, who has never had any tailoring experience, despite his claim of being trained on the row, just one of the lies he has spun to build his business into having some sort of credibility that it doesn’t deserve. There are also the guys from B&Tailor, who travel from Korea and do trunk shows at the finery company. True – those guys are all bespoke. Unfortunately, most of Sydney is priced out and won’t be able to afford their suits ($6k+ for 2 piece). There is nothing in between now (maybe JCutler’s apprentice spin-off brand “Canvas”)…. P Johnson used to represent that next step up from your Made in China suits…. but it is very sad to hear that they have allegedly been selling them for $2-3k range and marketing it as Made in Italy. As per my earlier comment – try Patrick Oh of Luxius in Sydney. He does both MTM and bespoke and his pricing is very reasonable. I’ve only bought bespoke from him (several three-piece suits) and I’ve been very happy with the fit and construction. Just saw your comment now – so are the suits made by his father? Or by a local factory? There’s a whole tailoring industry in Seoul (similar to China, Thailand, Vietnam etc.) where all the MTM suits are made from the same factory. These shops are predominantly based in Itaewon. And then you have B&Tailor… the epitome of Korean tailoring. ANYWAYS – how did you find your suits? Were they really bespoke? Or was it just MTM but with basted fittings…… I’m of the understanding that it can only be considered ‘bespoke’ if the pattern is drawn for your body from scratch… and that’s very hard if the Tailor is in Korea and you’re being fitted in Sydney… unless Patrick draws the patterns himself??? That’s not necessarily the case, Wen. Sometimes different people do take measurements, for the tailor to draft a pattern with, and then conduct fittings as well. The problem is that the reliability of this system varies wildly with the experience of the person doing the measurements and fitting. I have seen it work perfectly, and terribly. Thanks Simon. Definitely agree with you there. What’s your understanding of WW Chan? 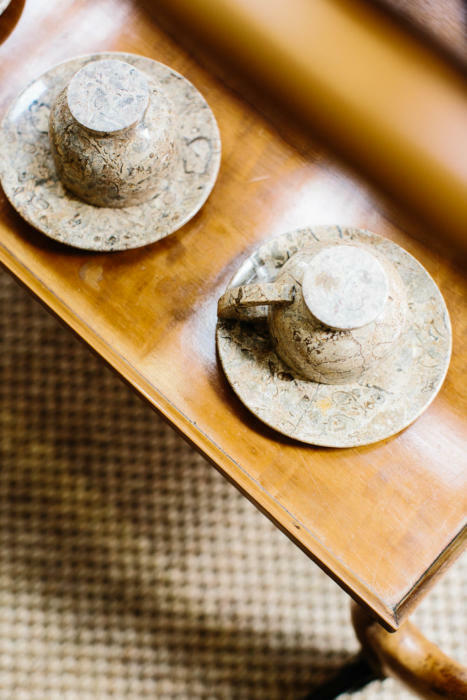 I called them and they said they are Bespoke but as we all know… definitions can vary greatly. I know you haven’t done a review of them or bought anything from them, but curious to pick your mind about their quality and pricing in today’s market conditions… I’m visiting Hong Kong next month and might consider a 2 piece business suit from them. Their starting price is 15,000 HKD (approx. £1500) for a 2 piece suit with fabric selectection from Hardy Minnis (Fresco) or Harrison’s Regency worsted wool. They are full bespoke, and I would recommend them. I’ve seen some lovely things, and visited them in the past. You can have full confidence in them. They’re wonderful and their product is great value for money. True bespoke indeed. Wen, W.W Chan are also going to Sydney (13-14) and Melbourne (15-16) in November this year, but if you’re in Hong Kong, definitely worth a look. If one were only going to be in HK for a short time, how are the multiple fittings managed? It’s hard – even getting one fitting in would require them to drop work for other customers to cater to you. But they might be able to, you can ask. However, I would generally advise against having a suit made with just one fitting, as a first-time customer. So you are likely to have to go back to HK. Plenty of tailors in HK will offer you a suit in a day or two, but usually without a fitting and usually to a very poor standard. Hi Wen, I know that they’ve recently made changes to their manufacture, apparently they have now hired a younger tailor to oversee things and it means that there’s now greater flexibility available eg. Neapolitan shoulders, different interior pocket configurations, that their old head tailor resisted. His bespoke is true bespoke. Patrick is a good fitter with an eye for detail and his customer service is great. I’m a perfectionist, I only really gave him a go the first time because I was curious about what his reasonable prices (similar to WW Chan) would result in, but I now keep going back to him (five suits and one sports coat) because of the quality. He’s a good fitter but a poor marketer and the reason that I sing his praises is that he deserves to succeed and I’d like to help him to that end. @JoshGTV – glad you had a good experience with him. What are his prices like for bespoke? Will you be doing a review of “Signature Bespoke”? Thanks for the candid review, Simon. A little late to this thread but I have to say, I largely agree. I first experienced P Johnson at a trunk show in Asia about two years ago and was drawn to the attractive publicity photos and casual. effortless style. Thought I’d try a navy linen suit since it seemed to be perfectly in line with their aesthetic. There was lots of emphasis on the high level of hand finishing in Italy and they kept talking up the ‘premium’ Carrara range which I opted for. The trousers were okay but the jacket was short, overly tight, bunching up terribly at the back, far too thinly padded and basically had to be re-done completely (fortunately at no extra cost). I was surprised that they did not get the fit even somewhat right and at £1200, this really felt a little outrageous. They eventually did get it fixed but it had a distinctively ‘trendy’ rather than ‘classic’ look which is not my thing at all (and certainly not what I wish to get out of a tailored garment, albeit at the MTM level). I have bought RTW jackets from Suitsupply with minor alterations that have fitted far better. Agreed that the only things worth picking up are shirts, knits and perhaps the odd pair of trousers. However, considering the recent escalation in prices, I’m not even sure if that remains a good option. I seriously hope they improve their craft as they continue to aggressively expand. What would be a comparable MTM at this price point in NYC? By comparable, I mean in ways of quality, fit, expertise, and style.